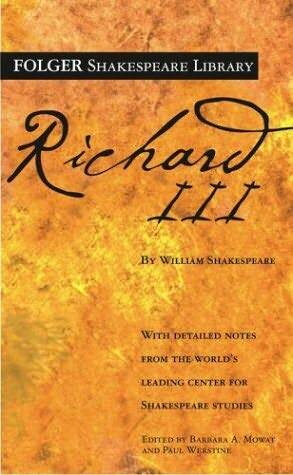 A Literary Odyssey: Book 129: Richard III by William Shakespeare (Shakespeare Reading Month). Book 129: Richard III by William Shakespeare (Shakespeare Reading Month). I've always kind of ignored Shakespeare's history plays. Even though I love history and the eras Shakespeare writes about, I shy away from the plays. In a way, I feel like I don't know enough to "get" them. But when I stop thinking of the history aspect and start focusing on the characters and action...I fall in love. This play, Richard III, will probably remain a favorite of mine. I wasn't sure what to expect going in, since I had never read it before, but I was intrigued by the darkness. It also opened with the above quote. I was intrigued from the beginning (especially after having read The Winter of Our Discontent by Steinbeck last year-cool to see where the title came from). Considering I had no idea what was going to happen, I was surprised by the amount of blood, murder, and deception in the play. I was truly impressed by the amount of evil one character possessed. He slowly begins "taking out" those who are next in line, as well as marrying whoever he thinks will help him win the throne. This is a bloody, bloody play. I lost count of how many people dear Richard offed. It seemed that as soon as someone seemed slightly uncomfortable with his thoughts and plans, they were next on the "hit" list if you know what I mean. And frame my face for all occasions." What a sneaky little man. I also love that this play didn't feel like history to me. Instead, it truly read as one of Shakespeare's tragedies (I think it is often referred to as The Tragedy of Richard III). The one main fault I had with the other history play I've read so far, Antony and Cleopatra, is that the action was very spread out to take in the scope of the historical events. In Richard III, I didn't feel that gap and the play flew by (I read it in one sitting). I was impressed with the way Shakespeare condensed and molded the events into 5 acts. There was plenty of action to keep the play steadily progressing forward, and I find myself not being able to find fault in it. "A horse, a horse! My kingdom for a horse!" And, as silly as that line sounds, I think it really speaks a lot to who Richard was. He would stop at nothing and would let nothing get in the way of his becoming king. To let a silly thing, like not having a horse, stand in his way must have been irritating and frustrating. It really speaks to his ambition and drive. And now, having finished this one, I am curious to see if any of Shakespeare's other historical plays can live up to this one. It blew me away-this is definitely one to make a priority! Just like Lady Macbeth might be the first OCD character in English literature, Richard III might be the first psychopath. I own this one and cannot wait to read it, having read all about it in my Guide to Shakespeare. It sounds INCREDIBLE, but it might have to wait until the spring for me. I read the opening solioquy the other day and KNEW I'd like it. I've since read about Shakespeare's histories and am intrigued! I think I'll especially enjoy following the adventures of Prince Hal in Henry IV. (I'm not sure if you've read the Henrys, but I thought I saw Henry IV in your sidebar recently. I CANNOT WAIT!) The histories to me feel like movies! Sometime when you are taking a break from the classics read Josephine Tey's Daughter of Time in which a detective tries to prove whether or not Richard did kill his nephews. Remember Shakespeare is writing under the Tudor dynasty -- it was Elizabeth's grandfather Henry VII who defeated Richard. I'm glad you like Richard III. It's my favorite and it was during my first Richard III reading that I fell in love with Shakespeare! This play has never appealed to me before but reading your review, I now want to try it, if only to appreciate the villainy of Richard! I haven't had the guts to attack any of Shakespeare's Histories yet either, even though I also love love love history. This review has definitely moved this one closer to the top of the pile though! I haven't read any of the history plays. Maybe one of these days.